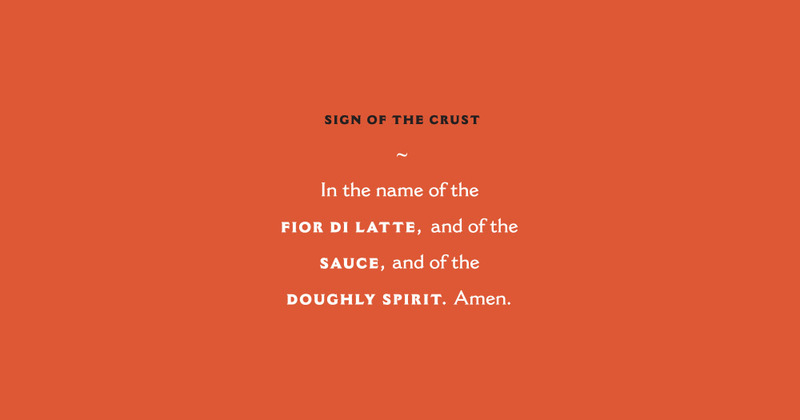 ten Pizzerias of Reverence. This is their path to Salivation. of Sacred Slices leading up to the Feast of St. Pizza. of devoted disciples, ten Pizzerias of Reverence, and a day to embark. And before setting off and breaking bread, be sure to Menuflect. religious and spiritual items. These items and more here. This mineral-rich water is sourced from the tunnels, aqueducts and reservoirs of New York and is known to give St. Pizza his strength. The water is sealed in a glass vial (2 dram) and comes with a Certificate of Authenticity. Anoint your slices with this consecrated olive oil, infused with red chile pepper from Wheated, a Location of Reverence along the pilgrimage route. The oil is sealed in a glass vial (2 dram) and comes with a Certificate of Authenticity. Obtained from various sacred sites along the pilgrimage path, these are the bones of St. Pizza himself! Each relic is sealed in a glass vial (2 dram) and comes with a Certificate of Authenticity. online learning community, Skillshare. Click here to view. Heritage Radio's show, Pizza party. Click here to listen.